Josh likes to go mountain biking on Saturday mornings. Mountain biking is not my thing, I am still getting used to riding my bike around the neighborhood, so I gladly stay with Caleb. I love our Saturday mornings together, just me and my little pea. I love shopping for fresh, local produce. Last Saturday we purchased zucchini, yellow squash, green beans, and a watermelon. 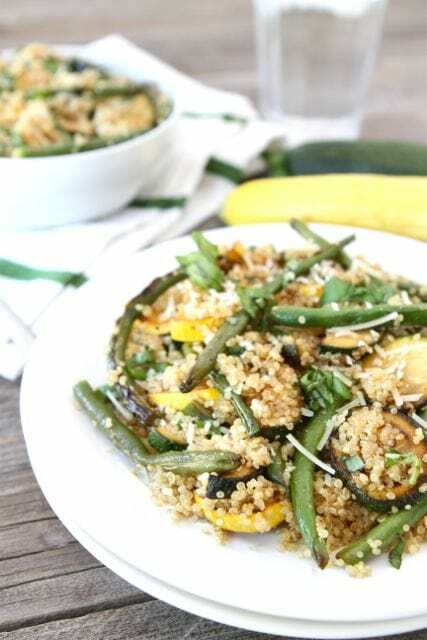 I used the vegetables to make Quinoa with Grilled Summer Squash and Green Beans. When Josh got home from his bike ride, I showed him our fun market finds and we made lunch together. We do a lot of grilling during the summer months. I love grilling because we don’t heat up the house, it’s a healthy way to cook, and the flavor is incredible. Plus, Josh always mans the grill so I don’t have to do much work..ha! I cooked up some quinoa and prepared the vegetables. I tossed the zucchini, yellow squash, and green beans in a balsamic dressing and put them in a grill basket. If you don’t have a grill basket, you can wrap the veggies in aluminum foil and place the packet on the grill. Josh grilled the veggies to perfection and I added them to the cooked quinoa. I stirred in freshly chopped basil and drizzled the dish with a splash of balsamic vinegar and olive oil. I sprinkled a little Parmesan cheese on top and voila-a delicious market fresh meal! We enjoyed our lunch on the patio and talked about our Saturday mornings. Josh always has good bike stories to tell and he loves hearing about our adventures at the market. I love summer Saturdays, especially when good food is involved! Don’t let summer’s bounty pass you by. 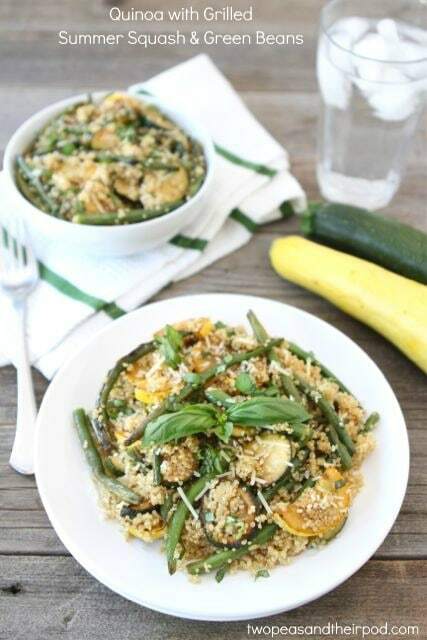 Head out to the market or your garden and gather some fresh summer vegetables to make this Quinoa with Grilled Summer Squash & Green Beans dish. 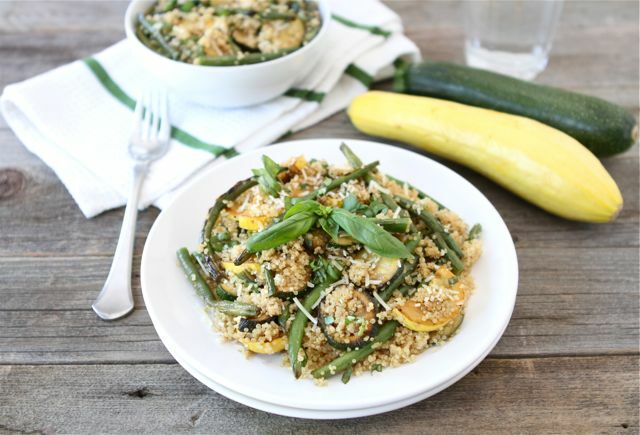 This healthy quinoa dish with grilled vegetables makes a great summer dinner or lunch. 3. Heat grill to medium-high heat. Place the vegetables in a grill basket. If you don't have a grill basket, spread out the vegetables on a large sheet of aluminum foil. Add a top sheet of foil and crimp the edges of the sheets together to make a packet. Place on the hot grill and cook until tender crisp, about 10 minutes. Remove the vegetables from the grill. This post is part of the BlogHer Market Fresh Cooking series, which includes 100 percent editorial content presented by a participating sponsor. Our advertisers do not produce editorial content. This post is made possible by Hellman’s/Best Foods and BlogHer. A perfect combination! That dish must be reallydelicious. 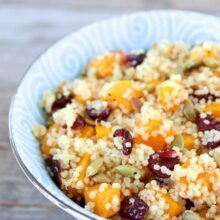 I’ve been wanting to make my first quinoa recipe (yes, late joining the band wagon), and this one sounds great! We love grilling and all the fresh veggies this time of year! Excellent recipe! I have all of the ingredients on hand, I have to make this dish, it looks so tasty!! Sounds so delicious! And very fresh too. Thanks for this healthy recipe. Sounds like Saturdays are lovely and I feel like heading out to the farmer’s market right now! Thanks for a delicious looking recipe! Let’s make dinner together. You bring this and I’ll eat it. 🙂 I’m also not a mountain biking fan. To be fair, I’ve never tried it. But biking up and down hills, on little dirt paths, through the mountains does not sound like something I want to do. I guess on the plus side you don’t have to watch for cars. However, seeing that I get lost while merely walking through the woods, it’s probably not the best fit for me. Aaaaand now I’m stopping this outrageously long comment. So….dinner? 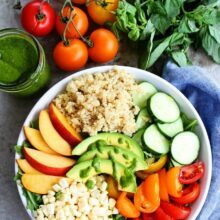 love this healthy quinoa recipe Maria! A great flavor and texture combo! I wish we lived closer to a better farmers market. The ones we had in Washington and California were amazing. The one here at Thanksgiving point is just, ok. Nothing special. Such a bummer. Love the zucchini though! Our garden is overflowing with the stuff! Come up and we will hit the SLC market together! This looks like such a great summer side Maria! Yum!!! This looks great, Maria. I keep looking for new recipes to use up all the zucchini that is always laying around. Sounds like a fun Saturday morning with Caleb. 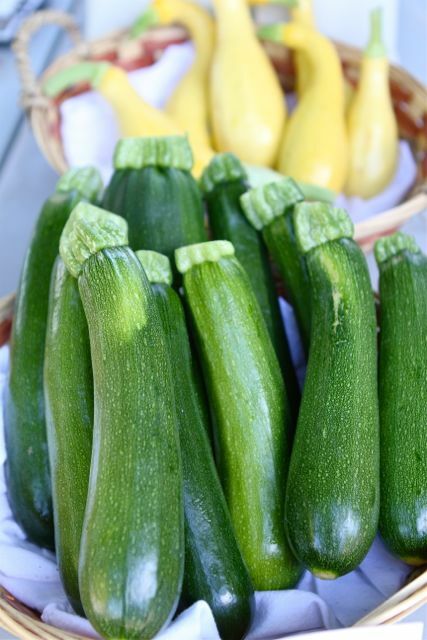 What are you doing buying zucchini?? I have a plethora. Looks delicious and I have a new recipe to use mine up on! Grill baskets are terrific, the basket makes it easier to prepare the entire meal outside, without the worry of little veggies falling into the fire. I like the nuttiness of quinoa, does the black quinoa have a sublte difference in taste, or is it dramatic? I have yet to try Quinoa! I know….sad, huh? This looks yummy. So excited!!! We have tins of squash…what a perfect way to use them! I need to get my hands on more zucchini before it it gone! This salad looks perfect! Grilling vegetables is our favorite way to have them! Love this salad! I have been all about quinoa and fresh veggies this summer. Grilling them would add such flavor, must try! I love zucchini! 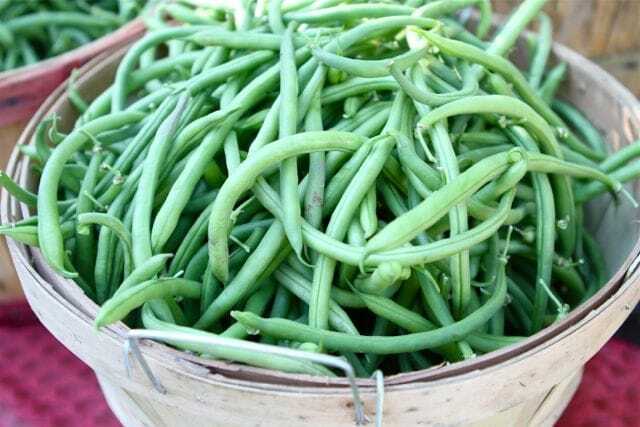 And those green beans look just perfect! Thanks for sharing a great recipe! 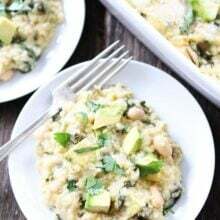 I’m heading to the farmers market this weekend and have bookmarked this recipe! Thanks! Your son is so lucky. I wish there had been farmers markets where we lived when I was growing up. I want to see all of those beautiful colors through the eyes of a child! I’ve been eating a lot of quinoa lately so this is right up my alley. oh Maria! This is right up my alley!! I love going to the farmers market on Saturday mornings too. This looks wonderful, I’ll have to pick up the ingredients this Saturday! I know cookies are your specialty, but I always get excited when you post your veggie dishes on here. They’re always so good and so simple to make! I am glad you enjoy our veggie recipes! I love all of the fresh flavors! I have been grilling more myself this year than I ever have before. (Usually my husband is the only one at the grill.) I need to try this out! yes, I love the fresh flavours too. Love seeing new veggie options and the mrs. is wild for zucchini (well, not really wild but loves them) plus we love quinoa. A definite meatless monday in our future. Beautiful combination of flavors. I love quinoa and always looking for different ways to make it. Great recipe! I LOVE all these ingredients. So healthy and perfect for summer. Yum! Love this, Maria!! Seems so fresh and summery…I want to make this now! This looks fresh and delicious – beautiful, Maria! 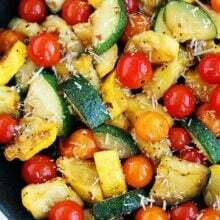 We’re always looking for new ways to use the zucchini and summer squash. I love this fresh market salad! 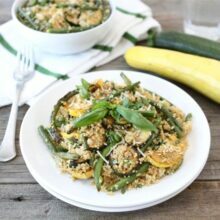 What a great way to use up the zucchini & squash. I am also eyeing those tasty chocolate and zucchini cookies down below. YUM! This looks like a delicious recipe! I can’t get enough quinoa these days. I just love what you do with quinoa! This looks so delish! Looks like a perfect summer salad Maria! Maria, this is like the best of summer in one dish. LOVE IT! I really need to get back into my farmers market routine! What a great use of this summer produce! I would love to dig into this with a huge spoon! So delish! look at all those vegetables, so beautiful!! That is a great recipe! Perfect for summer! not precisely what you seek, you can tailor them to suit your specifications. tree is limited, and most real ones are too big. I had a pile of green beans. I needed to use them, and wanted a different idea, for cooking them. This was simple and delicious. I also had yellow squash, so it was perfect. I also threw in some peppers and onions.